Once upon a time I thought my relationship with backpacks would have ended with college. How wrong I was. Whether it’s work or play, I’ve come to rely on a good pack in the decade-plus of my adult life. Recently I was given the chance to test the Ascent, one of the new packs announced by Ogio at CES this year. During my time with it, it has come to exceed my expectations. Let me tell you about it. I’m putting this out there right now, the Ascent isn’t a battery backpack like the PowerBag or Energi+, so if you’re looking for some technology laden features, the Ascent isn’t your pack. It’s designed to carry your stuff and it’s remarkably good at that. The Ascent is a hybrid bag of sorts. 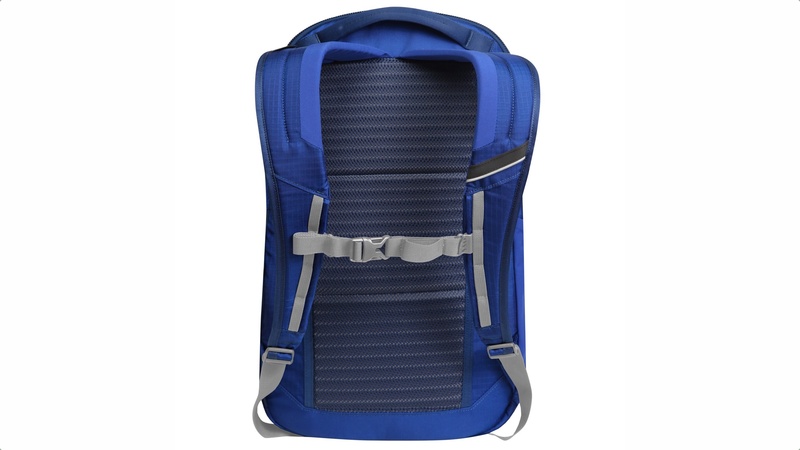 It has lineage from both urban and mountain bags. This suits me just fine, since my needs for it are both business and taking it out while hiking. The mountain heritage makes a bag that is sleek, uses rip-stop nylon, and allows for a lot of movement by the wearer. It doesn’t have that much less usable space than my PowerBag Business bag, but is far less bulky. With the positioning of the padding, I’d say the Ascent is the most comfortable backpack, I’ve ever had. When I say there’s room, I swear Ogio has Time Lords on staff, because I could swear it’s bigger on the inside. There are three large main pockets. In the back is the laptop pouch. It can fit most portables up to 15″. As thin as it is, my 15″ MacBook Pro Retina had room to spare. The middle pocket is huge. I’m a not small by any means and reaching in still took a good three quarters of my arm length to reach bottom. 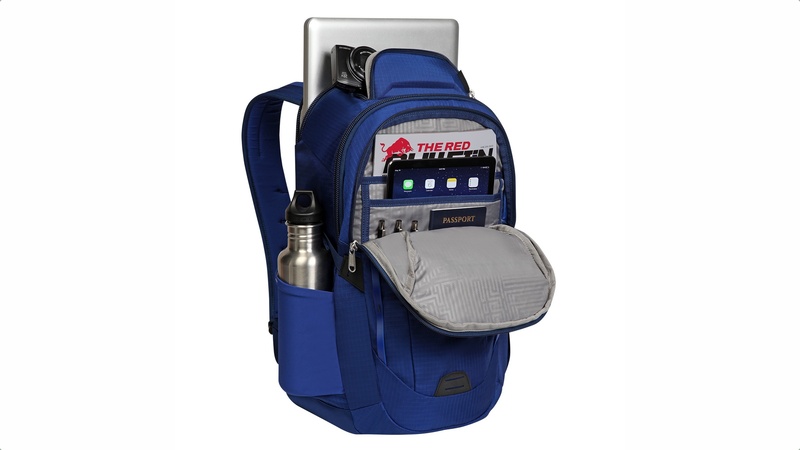 Whether its clothes, a USB monitor, or what not, you have an ample amount room in that pocket. The front pocket isn’t much smaller, but is subdivided into a 3 smaller pockets and a large front cavity. I’m not talking about shallow pockets either. The back sub-pocket will fit a full-size iPad with plenty of room to spare while the middle will comfortably fit an iPad Mini. The third sub-pocket can fit a calculator or smartphone and up to 3 pens/pencils/styli. There’s there’s also a hard pocket on the top Ogio calls the “tech vault” but most smart devices will be too large to fit. Rounding out the pockets are a water bottle pouch and a small pocket on the back side that’s so small I’m not entirely sure what its for. Fit and finish of this bag is really well done. The stitching is perfect and it has some really nice accent features. The main color, whether it be black, white, khaki, or blue is paired with a high contrast secondary color. Unlike most backpacks, which will have a grey or black interior, the neon yellow on my black model not only is visually pleasing, but really helps finding your objects. The large backpad also has that neon yellow color. One very very useful touch for this bag is the extenders on most of the zipper sliders. It makes the pouches extremely easy to open and shut with a single finger. Ogio put a lot of thought into designing the Ascent and it shows. The Ogio Ascent is right around $100. Given the quality of the bag, I find this price to be a good value. It is built to last. 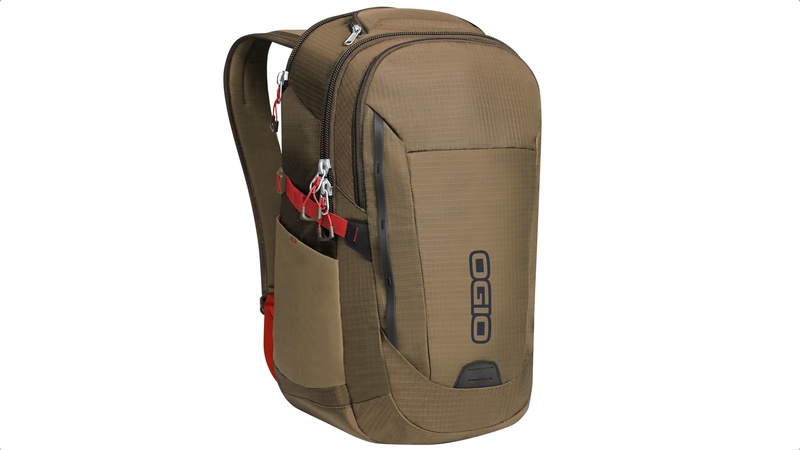 Honestly, I can’t find a whole lot I don’t like about the Ogio Ascent. It’s incredibly comfortable, very well made, and has a HUGE amount of storage space for its size. It’s a bag I know I can be rough with on the weekends and it’ll be ready for the work week when I am. The quality and versatility make the Ascent a bag you should definitely take a look at.